North Florida cave diver, Woody Jasper, first invented sidewinder-style reels around 1980. Less likely to entangle than other reels on the market, Woody’s original reel was made of aluminum and a PVC spool. The side-handle style of the reel lent itself to exploration because it could easily switch from hand to hand while laying out line. Our Sidewinder series of reels are designed to be anti-jam by using precision machine tolerances between the frame and the spool making it nearly impossible for the line to slip between the spool and the handle. The Sidewinder Cavern/Safety Reel is available with 140-feet of #24 braid line with a medium stainless bolt snap. • DuPont™ fiber braid line provides strength and minimizes fraying. • Cave series reels use #24 braid line giving 220-lbs of breakage strength. 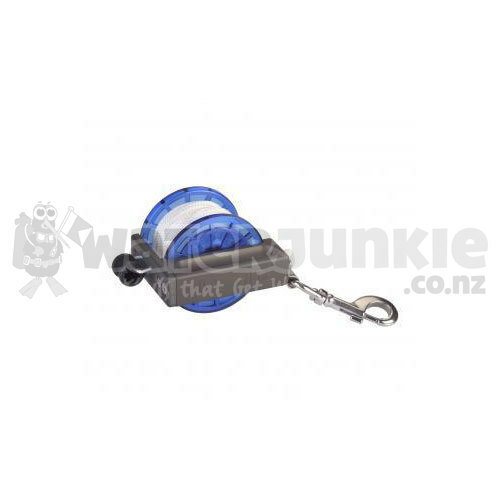 • Injection molded polycarbonate spool resists breakage and cracking. • Marine grade stainless steel frame and axle are corrosion resistant. • Marine grade stainless steel bolt snap is corrosion resistant.